A Liberal's Libretto: In 2008, Peter Gelb earned what? In 2008, Peter Gelb earned what? 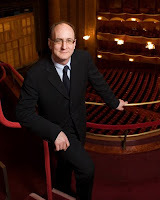 In his second year as general manager of New York’s Metropolitan Opera, Peter Gelb earned $1.5 million, according to the company’s FY2008 tax return. His compensation included $1.4 million in salary, pension benefits of $41,100 and an expense account of $71,731. The package was worth $1.1 million the prior year, which means an increase of 36 percent, to be exact. 36 percent is a large number. Especially when you take into account the MET's current course through rough financial waters. I mean come on... Mr. Gelb even negotiated a delay in an itty-bitty 2.5 percent raise for the stagehands. Those were my thoughts, too. But, when I took a second to think about Mr. Gelb's job performance, his raise seems to fit the bill. In 2006, the MET was reportedly in its fifth year of sliding attendance, and the audience's average age of 65 made a continuing decline seem likely. Since then, he has increased new productions, brought up box office sales, managed to regain exposure in the press, and introduced live high-definition transmissions into movie theaters around the world, bringing live opera to millions of people. Simply put, Peter Gelb has increased in-house attendance, increased the exposure of the MET and in doing so has made opera readily accessible to the many people who would not normally be exposed to it (ie: a younger audience). But, not all reviews of Mr. Gelb are positive. I know... shocking isn't it? [insert eye roll here] In January, the NY Post's Page Six ran the "article" - MET DISCORD OVER 'HATED' BOSS. The fact that Page Six wrote about the drama behind-the-scenes at the MET is another Gelb accomplishment. There is no such thing as bad publicity, right? I understand that the MET, in chorus with other arts organizations, is going through financial discord. And it might be true that Peter Gelb's ego is bolstered by the fact that he runs the largest opera company in the country (/world). But, think for a moment about where the MET might be if Peter Gelb had not been managing the company during the last 2+ years - if he had not increased exposure, box office sales and accessibility. Let me take this opportunity to remind you of the multitudes of difficulties surrounding the neighboring opera company. Now, Peter Gelb isn't looking so bad, is he?